Sold a home in Studio City, CA. Tammy is highly experienced and knowledgeable and a total professional. She was very responsive and explained all of the ins and outs of the process with me. Tammy far exceeded my expectations in every way. And best of all I received well above the asking price. Tammy was a pleasure to work with, and I highly recommend her. Bought and sold a home in Toluca Lake, CA. Sold a home in Toluca Lake, CA. Whenever you are thinking about selling or buying your house, you need to have a realtor who has your best interest and knows the market well. 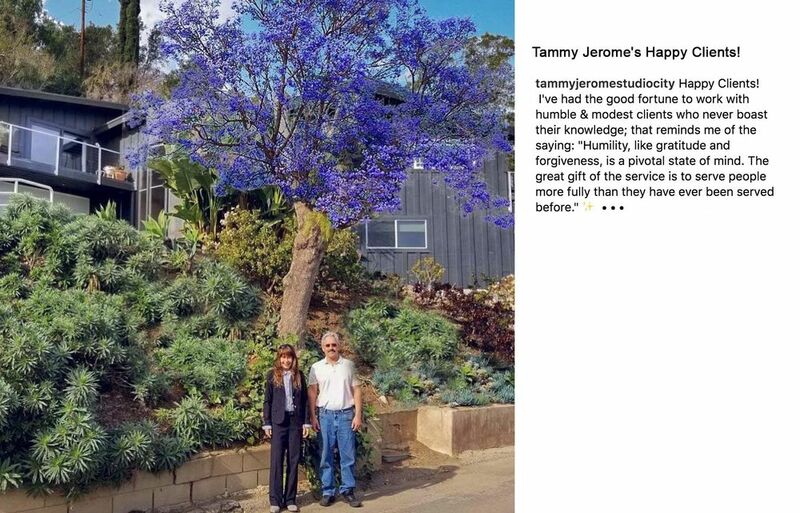 Rarely, do you ever use the same realtor in LA for buying/selling your house, unless they are good, and Tammy is just that, very very good at her art. If you are a potential seller, she knows the market, timing, and provides constructive feedback on pricing your home correctly, so that buyers will come. If you are a buyer, you are in really good hands, as she is nitty gritty about the details and give you the confidence in getting the best value around location as well as resale value when you decide to sell. - a Very Happy Client. 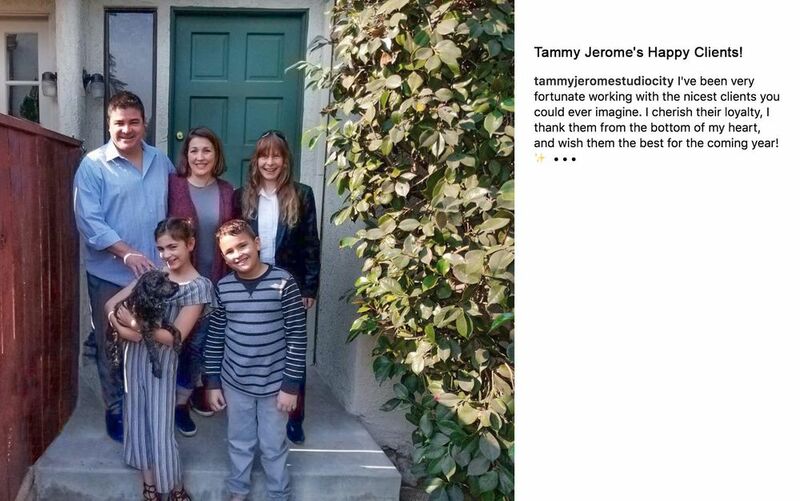 Tammy Jerome is the Queen of Studio City. There is none better! Her knowledge of the area, (that she lives in, and loves) is super helpful for both buyers and sellers. In my case, she sold my townhome, and her ability to smoothly make all matters pertaining to the transaction happen correctly and quickly, proves that she knows every detail that is needed. My instinct in having her list my home, was spot on. Tammy is the TOP OF HER CLASS. Bought a home in North Hollywood, CA. Tammy really went way above and beyond in helping my wife and I find a home as our buyer's agent. She was very responsive and explained all of the ins and outs of the process with us. She knows the San Fernando Valley very well and was very professional with all of her communications. Highly recommend her and I hope she is available to represent us whenever we need to sell our house. Sold a home in North Hollywood, CA. Thankful for your service, you were a true lifesaver ! Sold our house in 3 months. It was a pleasure working with Tammy Jerome ! She is a very profesional person, responsible when it comes to her clients, and helpful and patient in every extend." Bought a home in Sherman Oaks, CA. Words can not express how thankful and appreciative I am to have worked with an exceptional agent, Tammy Jerome! It was a smooth and enjoyable transaction and all those couldn’t be any better without Tammy. She was on top everything, so responsive, available all the time for all concerns and questions and most important thing she was so professional, experienced and fair. Thank you so very much my dear Tammy. Bought a home in Altadena, CA. We were lucky enough to find Tammy, We absolutely loved working with her. Not only is her experience impressive but she always had the best attitude towards any issue we ran into. She listened to our questions and concerns and always had an answer or a solution. We can never thank her enough for guiding and helping us find our first home. Bought a home in Toluca Lake, CA. Tammy was instrumental in helping me buy my first home. She was positive and great at trouble-shooting every issue that we ran into. She tenaciously worked with me through a somewhat complicated home buying experience until success was reached. Thank you, Tammy! Sold a home in North Woodland Hills, CA. She's awesome! Can't thank her enough! She made sure our sale went through smoothly. She went above and beyond. Our house was on the market for only a couple of days before she got us an offer! She's truly a professional in this industry. Rented a home in North Hollywood, CA. Tammy Jerome was recommended to be by my friend Anne. She had sold Anne's home at ABOVE what she was asking and also found a nice home for her as well. I have a property I needed someone to handle for me, since I had to go back to NYC. It was a difficult task. Tammy and her team came through for me. Not only they helped pack things up and remove them, but Tammy even arranged for other items to be donated to a battered women's cause for me, she has been a tremendous help and has kept me in the loop every step of the way. If it had been anyone else, I would have had to fly back to LA to coordinate all the many things that were left to be done. I also like the way she is focused on the best interest of her client rather than the fastest or the easiest way, she has a very strict non-nonsense vetting process. Just like my friend Anne, she even got me a higher price than what I asked for, she's that good! There is a reason why she has the great track record over decades. With no hesitation: I highly recommend Tammy! Sold a home in Sherman Oaks, CA. We are extremely happy with the way Tammy handled the sales of our property.She is diligent, knowledgable and persistent. She is also a great and tactful deal maker. We highly recommend Tammy for purchase or sales of real estate. Tammy Jerome was incredibly helpful and went out of her way to help us sell our home. We had some very difficult challenges with regard to our home and Tammy was right there through s thick and thin. She helped us to get through all the hurdles which were unique to our home and which made it particularly challenging to sell. She was always very prompt, very easy to reach, and I just cannot tell you how generous she was with her time--above the call of duty. I mean it sincerely. I would highly recommend working with her. When I decided to sell my house, the only person I could think was Tammy Jerome. Knowing her reputation as tops in her field, I’m glad I made that decision. Tammy worked tirelessly to see that my house sold at a fair price, yet was always courteous and thoughtful. When it comes to the best in realtors, Tammy Jerome is simply the best! Sold a home in Burbank, CA. As a first time home buyer in a new country, I feel lucky to have met Tammy. I understand that there is a difference between an agent and a Realtor but Tammy is beyond all of that. Tammy is great to work with because even though she is busy taking care of her many clients she still makes the time to take great care of you. She is very knowledgeable and personable, but "fierce" when it comes to fighting for you. With her help I got a great deal on my condo in Sherman Oaks and 5 years later she helped me sell that very same condo for well beyond the market price. I sure recommend Tammy in a heart beat! Sold a home in North Hollwood, CA. I met Tammy a few years ago. She got great tenants in my house while we were waiting for the prices to come back up. Finally, prices were good enough to list and sell pretty quickly. Great, hard working person. She deserves the highest praise and reward! Bought a home in Studio City, CA. 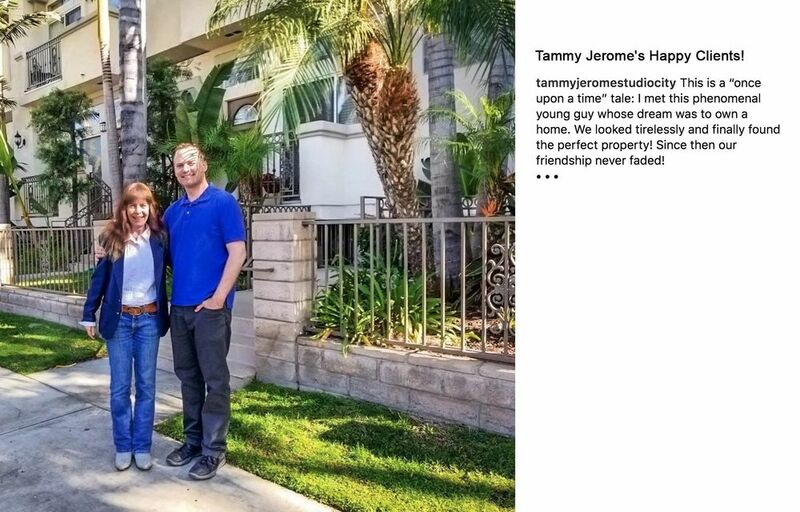 When my husband and I decided to purchase a home in the Studio City/Toluca Lake area we called on Tammy Jerome to represent us. It was comforting to have a seasoned realtor who had SO much knowledge and experience in the area. She quickly understood what we were looking for, in what price range, and kept our expectations realistic. She was there for us through our difficult negotiation and always remained calm and optimistic when things became stressful. Her and her team are the utmost professional and I will recommend her to everyone I know. Thanks so much, Tammy! Tammy Jerome is the BEST! I rehabbed my condo floor to ceiling in 3 1/2 weeks. 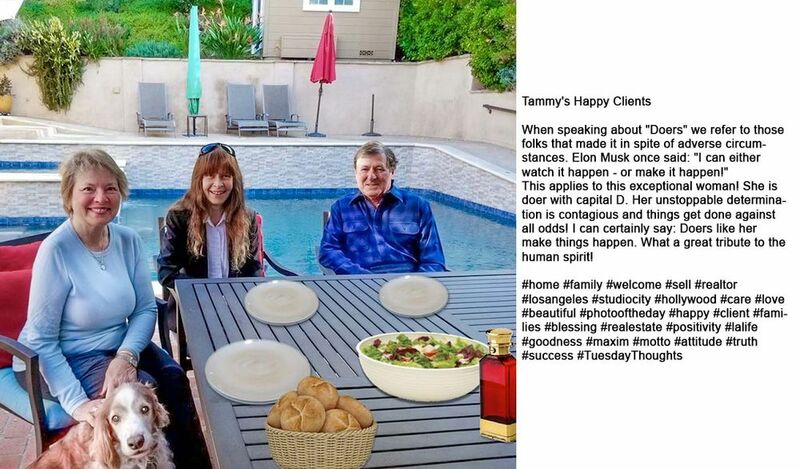 With Tammy's vast marketing strategies and experience, the day she put it on the market there were 4 offers...2 offers @ $20K over the asking price. Tammy really knows the market conditions and the best way to sell a property. I couldn't have asked for a more knowledgeable or professional agent. And best of all she was a real joy to work with. I highly recommend her. Tammy was the seller's agent for the house I was buying. Since this was actually the first house I looked at, I did not yet have an agent myself -- so Tammy became mine. Whereas I was at first apprehensive having the same person represent both buyer and seller, that fear was quickly alleviated once I saw how professional, honest, reasonable and down-to-earth Tammy was. During the process she became one part Realtor, one part friend and one part psychiatrist. Due to a host of factors (none due to Tammy) this was not the smoothest of transactions, however Tammy was there through thick and thin to see me through it, and for that I am grateful. 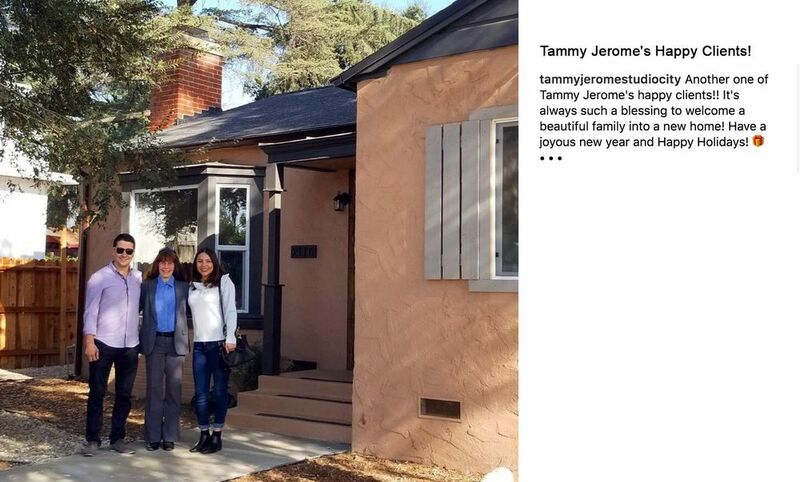 There is a reason so many homes in the Valley are sold by Tammy Jerome -- she is great, and a real go-getter. And now I am thrilled to have her as a neighbor! I bought my first home with Tammy and I am thrilled that I found her to help me through the whole process. She was extremely knowledgeable and always went out of her way to work around my crazy schedule. After some time going through the crazy market that is out there presently we finally found the perfect home. She knew exactly what I was looking for and we got it! I completely trust her experience and I highly recommend working with her. Bought a home in Valley Village, CA. Tammy is the best realtor we've ever worked with. She helped us sell our home quickly in a very bad economy. We were impressed with her expertise and her work ethic. We live in Northern CA but were selling a home in the L.A. area. Initially, we thought we were going to short sell and Tammy was very diligent about calling the banks and getting that process underway. (No easy task.) Tammy was always communicative with us by phone and email and answered our questions day or night. Ultimately, we sold the home in a traditional sale and she worked fast to get us a buyer and a great price. If you want the best, we HIGHLY recommend Tammy Jerome. Tammy represented us as the buyer and she was the listing agent too. She was extremely professional and handled the transition of buying and selling so well that both us and the seller love her. She was very personal and understood the emotional stress on both parties. In fact, we and seller are friends now because of her. Tammy sold a former owner-occupied condo turned rental property of mine recently. I could not be happier with her level of service; everything from her prompt response time to explanations made this is a smooth transaction. Additionally, I now live out of state and Tammy dealt with my renter: working with him to effectively show the property and getting him out on time once we were under contract. I never thought that selling a property across the country could be so easy. Sold a home in Los Angeles, CA. Tammy did an amazing job listing and selling my condo in what was a difficult market. Her knowledge of the marketplace and attentiveness from start to finish was stellar. I highly recommend Tammy whether you are buying or selling. Sold a home in Valley Village, CA. Tammy Jerome is the best real estate agent. I had a short sale that was a nightmare. One and a half years, five offers, and a bank that kept changing its terms and it's mind. Tammy hung in there with me. She never gave up. Through it all, she had a professional, kind, respectful, honest attitude. My place got sold to the perfect young couple starting a family. I feel my place is going to be well taken care of and the right family bought it because of Tammy. We have thoroughly enjoyed working with Tammy. She is definitely a real go-getter. From day one, she was on our side and did everything that she could in order to get us our dream home. She even went above & beyond the call of duty in several instances. You can tell that she genuinely cares about her clients. We have already recommended her to several friends who are currently in the market and will continually recommend her to ANYONE in the market for a new home. A+. Excellent negotiator. Extremely knowledgeable & very professional. You will see exactly why she is in the top 1% of agents...NATIONWIDE!!! Thank you, Tammy. We sold our property in April 2011....Certainly not the best time in the real estate market! Tammy was AMAZING!!! She used incredible marketing tools to introduce the property. The house was practically sold before it went officially on the market. In fact, after the open house, a bidding war ensued, bringing the selling amount to many thousands of dollars beyond what we hoped for! Her professionalism and guidance helped us throughout the process. We have highly recommended her to others and they too have been very pleased. Bought a home in Van Nuys, CA. Tammy and her team are the best of the best in the Valley! She helped us find our dream home, got us a great price and even some discounts, she is very professional and loves and enjoys what she does... if you need to buy or sell Tammy is the one to contact !! Bought a home in Winnetka, CA. It is with enthusiasm that I recommend Tammy for this prestigious award. Ms. Jerome is absolutely amazing. Her professionalism, creativity, and perseverance is without comparison. When she takes on a job, she is relentless in her pursuit to find "just the right" property. Her relationship with the customer does not end when the property is found--she continues and offers support until every "i" is dotted and every "t" is crossed. She is wonderful!! Sold a home in California, CA. Tammy Jerome has been my dedicated realtor since 2001, helping me with two purchases, and one sale. Her professionalism and knowledge of the Studio City / Sherman Oaks area is top-notch. Tammy definitely made the home buying (and selling) process easy, and took the time to explain everything through and through. She has also helped my brother with his first home purchase, who also had a very positive experience with her. I would recommend Tammy for any real estate transaction in a heartbeat. Tammy was great. She did an open house every Sunday to try to get my house sold. She was always there when I had questions. She even went as far as hiring a stager. If I was to ever sell my house, I would definitely use her again. Sold a home in Reseda, CA. Tammy proved to be the best real estate agent for the selling of my home. Immediately after signing papers, she provided lovely photos with enticing captions. Within three hours, interested clients were walking through the house. She also provided an open house, and terrific advertisements in L.A. Magazine and on the Internet. Within five days, an offer at full price arrived, and in 5 weeks I was living in my new residence. I was quite nervous about all that goes into selling my home, but Tammy took the lead. She was empathetic, available to answer all questions, give expert advice, and fearless in dealing the issues. Bought a home in Agoura Hills, CA. Tammy helped my wife and I purchase a condo for our son in Toluca Lake. During the process, we found that Tammy was extremely patient and knowledgeable. She provided sound advice and never pushed us in any particular direction despite the fact that two of her own listings were in our price range. Tammy promptly returned our calls, was extremely responsive to our needs and provided outstanding service. We couldn't have been happier with Tammy and highly recommend her. Because I moved across country before my property went on the market, I needed a Real Estate agent who could be my eyes and ears in North Hollywood. Tammy was the perfect person to take on that job. We had offers coming in in as few as 7 days. The closing process took longer than we'd hoped, but it was successful and I was confident that Tammy was on top of the process every step of the way. Although I had been offered a program that included a rebate to me if I used another agent, I selected Tammy because of her experience and knowledge in the type of sale I needed. 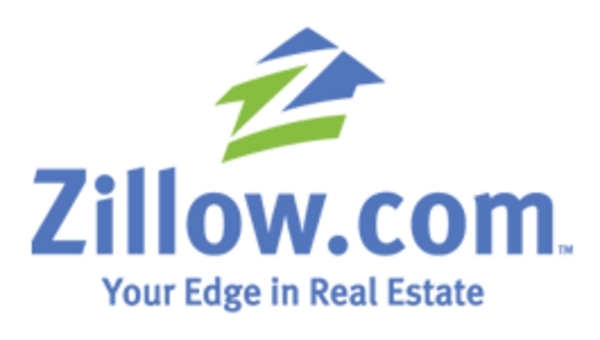 I have been meaning to write this review since we closed escrow in September 2011. Tammy is the BEST!!! She is very sincere and truly cares about her clients. 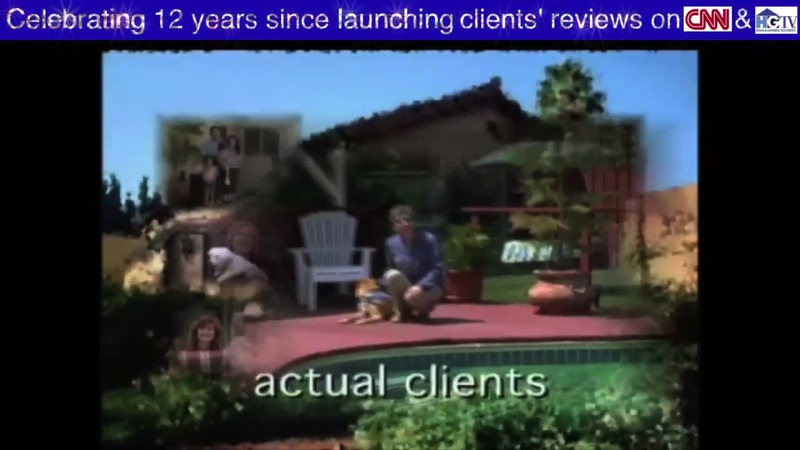 I have been a client since 2009, first leasing my condo, then eventually selling it. Tammy makes things happen and I have not met anyone so responsive to my needs. Thank you Tammy, and her assistant, Mike!!! Sold a home in Canoga Park, CA. 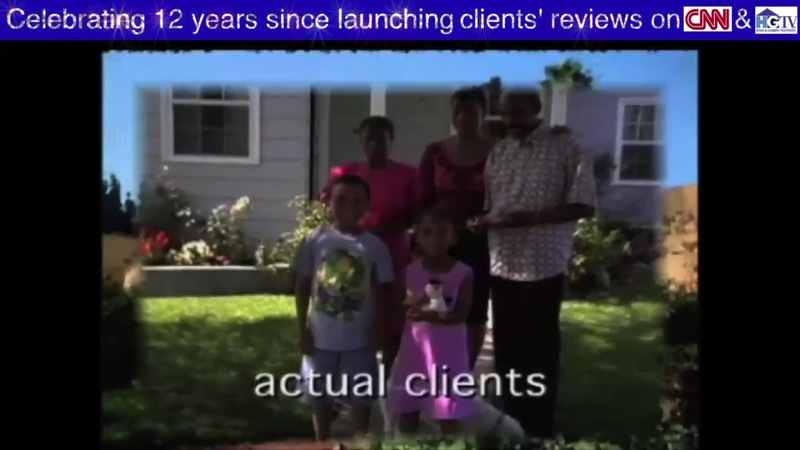 In February of 2011 we contacted Tammy Jerome to sell our 3 bedroom home in Canoga Park, California. Who said Superheros no longer exist? They do and we have met on named Tammy Jerome! Think of the most challenging task and then double it; that was the selling of our house. 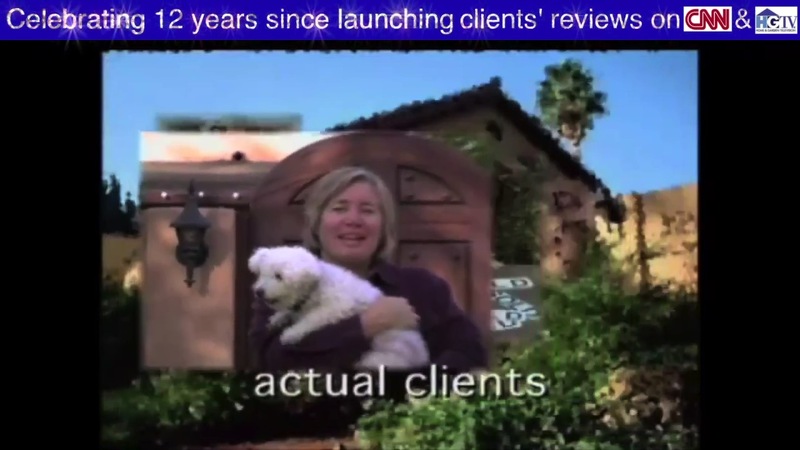 If it was not for Tammy's patience, business savvy and Real Estate knowledge; we would have never closed Escrow. We can not thank Tammy enough for her dedication to getting the job done. 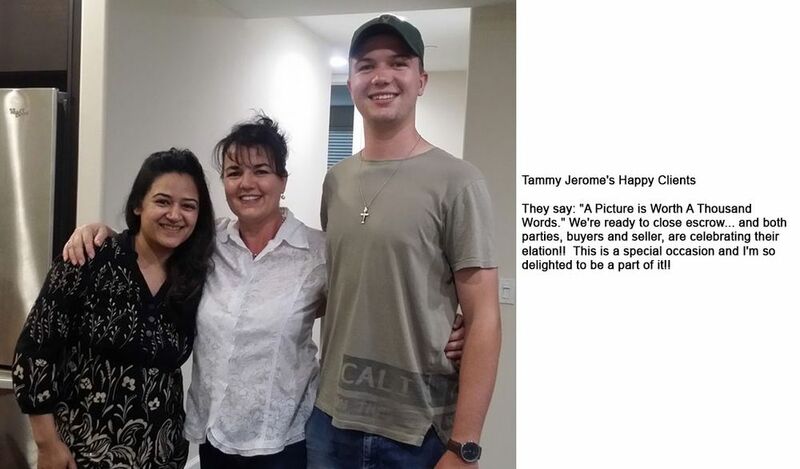 Tammy Jerome IS the hardest working Real Estate Agent out there and we wish her continuous success. I highly recommend Tammy Jerome. I was nervous to be doing a short sale of my condo, but Tammy's experience and full commitment to my short sale gave me the confidence to proceed. She and her staff always kept me in the loop and made me feel like I was in control of the process. In the end, the short sale experience ended up taking less time and being way more painless than I expected. Thanks, Tammy! Tammy was very detail oriented when finding our condo. She actively listened to what we wanted and delivered almost everything (within our budget). Her responsiveness via phone calls or email was extraordinary and she was always available to discuss and clarify issues that arose. I already have recommended her to many people and will continue to do so. 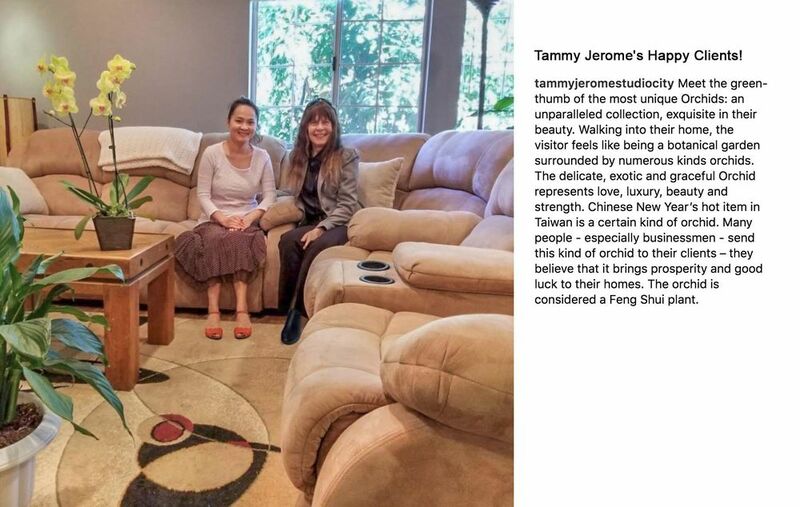 Anyone looking for a a place in the SF Valley, will be very impressed with Tammy's knowledge of the area. Tammy is one of those rare realtors that truly have a vision for each and every client. She works with your budget and nails a deal. She was my realtor and was always on my side and never gave up on searching for the right house for me. She was dedicated, tenacious and really insightful. She made the whole process, stress free! She has great insight into her service areas and will work in helping you choose the right neighborhood. I loved working with her and I will continue to work with her in the near future! Bought and sold a home in North Hollywood, CA. I met Tammy 16 years ago, as a single woman and first time home buyer. Tammy was the listing agent on the condo I purchased in North Hollywood. I found her to be efficient and knowledgeable. My first experience buying a home was positive, so much so, that when my husband and I decided to sell our condo, we contacted Tammy. Tammy was very helpful in giving us direction to get our place ready to list, (including contacts to help with repairs). Tammy came over to take the photos of our place and made our home look fantastic on all of the digital listings. We appreciated being able to get a hold of her easily and that her response time was pretty fast. Once we were listed and the ball was rolling, Tammy never stopped the momentum to sell our place. When we wanted to view homes, Tammy was right there to take us to every home we were interested in. The home we had our hearts set on and knew was the one, seemed potentially difficult to attain. 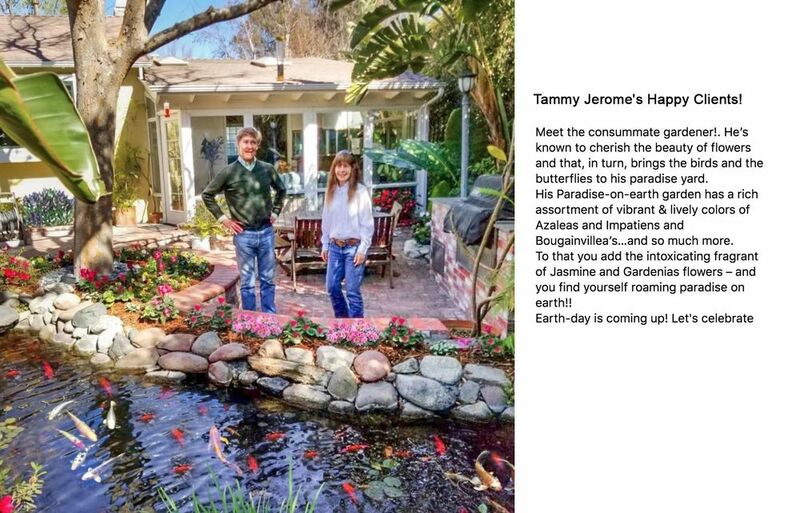 Yet, once Tammy saw it and saw our love for the home, she was incredibly diligent, persistent, and tenacious...in the pursuit of this dream house. We are certain, that without Tammy, we would not be living in our dream home now. (Escrow closed quickly on both our condo and new home). Tammy and our team worked so hard to make sure that everything went smoothly and Tammy wanted to be sure that we could move directly from our condo and into our new home. It was seamless and a dream come true. Tammy is a hands-on, invested realtor. She loves what she does and has passion and enthusiasm in her work. We are so grateful for Tammy and highly recommend her to anyone buying or selling their home. Tammy and her team were exceptional throughout our sales process. They were thoughtful in there recommendations and always took our opinion and needs/wants into consideration as they helped sell our home. They made themselves available at all hours of the day, did all of the heavy lifting and kept their word from start to finish. We are very pleased with our experience and very happy to have met and worked with her and her wonderful and kind team. I chose Tammy based on her experience with the area and the number of condominiums she sold. She is highly experienced and knowledgeable about market conditions in Sherman Oaks, North Hollywood, Studio City areas, and has a good reputation for it. It took about 2 months to sell, and I feel that she was able to price it right based on her assessment. She was easy to work with whenever an issue arises. She works hard, and I was able to expect that my e-mails or calls would get replies without undue delay. She was diligent with checking on the escrow company and the buyer to keep track of the progress. I am glad I had her as my agent. This is our third real estate deal that Tammy has brokered for us. She is the consummate realtor, totally professional, ready to always listen, provides constructive input with pushing and always available. We will definitely work with Tammy again in the future and would not hesitate to recommend her to others in need of a realtor in the valley! Polite, respectful and always aware of what was going on, Tammy was very easy to work with and very helpful throughout the process. She provided accurate information about the timeframe of when the property would be closing and was also in communication quite often about details that I had to be aware of. Tammy Jerome made our first experience selling a home smooth and successful! Tammy was always there to answer questions and provide guidance. Through her many years experience, she was able to help us sell our home quickly, get us a great price, and make us feel informed and comfortable throughout the process! Tammy is fabulous, hard working, responsive, and experienced! I met Tammy thru my son, what a pleasure it was meeting her. Later she helped us sell our Townhome in studio city...my son and I never really had to do much since she was great at handling all that needed to be done, she sold our place in a very short time. To this day she still checks in on us, which is always good to hear from her. Rented a home in Woodland Hills, CA. I have done a few deals with Tammy and love working with her. She knows the industry and continues to impress me after all this time. I highly recommend her to anyone that wants to Buy or Sell as she is the queen of closing deals. Very Knowledgeable, professional, and most important very kind. Tammy did an outstanding job selling my home in Studio City. Tammy was always available to help out and she promptly responded to my phone calls and emails. She gave me excellent advise to what should be the sale price and staging the home. She did a lot of marketing of the home and she had a number of open houses. We had different offers on the property and she did a great job of negotiating with the different buyers. In the end, we sold the home and I was happy with the sale. Tammy was always very easy and pleasant to work with. I would fully recommend her to any of my friends and family. Tammy was able to sell our house which had been on the market for 3+ years, a feat that 7 other previous agents and their agencies failed to accomplish. Tammy far exceeded our expectations as well as being extremely diligent, conscientious, professional, innovative, focused, and tenacious. We moved out of state before the house was sold. Tammy communicated with us daily and took on the task of coordinating all inspections and any minor repairs that were deemed necessary for escrow to close. Her customer service is outstanding! Thank you Tammy. Bought a home in Sylmar, CA. Tammy is a very hard working agent. She has many years of experience and I went to her upon a recommendation. She was very responsive; available to answer questions via email and phone. She was persistent with the seller’s agent, which made me feel that she was looking out for me. Everything was done in a timely manner. An agent with her level of commitment is very important in this market as everything moves very fast. Tammy is a rare and very fine blend of the personal and the professional. She "knows her stuff," and communicates it in such a way that allows for every possibility. In other words, she's not just a bottom-line dollars and cents person. She sees the big picture and skillfully and sensibly manages the complete transaction. Sold a home in Glendale, CA. Tammy went above and beyond to sell my home. Her photographer took amazing photos and my home was listed on so many sites I was thrilled. My home sold after the first open house with several offers! I can't thank her enough for everything she did. I would refer her (and have) to anyone selling their home! She was a calming factor during a very hectic time. Thank you, Tammy! Tammy was so great during a less-than-desirable situation (out of her control). I was first time homebuyer and she really looked after me and protected me, almost like a mother. She stood up for me and made sure I understood everything always with a smile on her face. Tammy sold my townhome within a month at nearly the asking price, eventhough the price was well apbove teh apraisal. Profession, integrity, and a pleasure to work with. 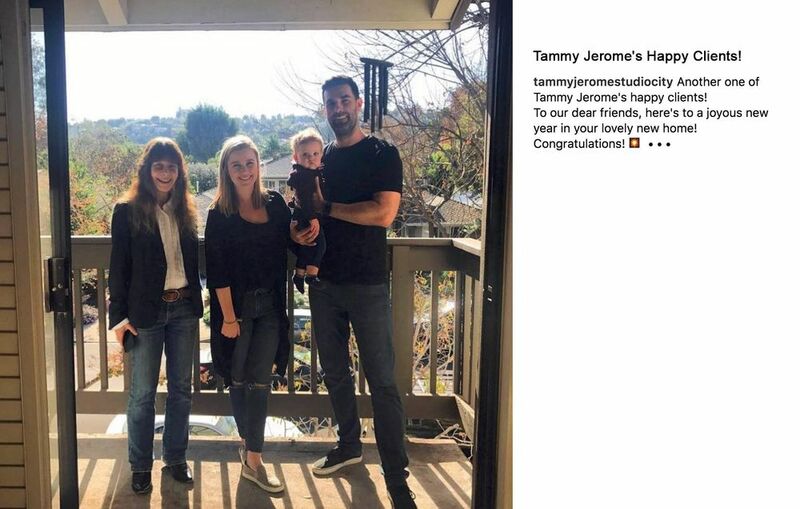 If I were to buy a home in Los Angles again, Tammy would be tbhe agent of choice. Tammy helped selling my condo. She is very professional and friendly. She made the process very easy. She was attentive and available when I had questions or concerns. she is a pro and sold my condo in less than a month. I definitely recommend her to my friends and family. Tammy came highly recommended and we were not let down in any way. We wanted someone familiar with the area, plus she lives close by which came in very handy.Her marketing skills are amazing and her professional photographer makes your home look like a million dollars. Our home sold on the first open house which surprised us very much. Tammy's negotiation skills can't be beat and she truly deserves her 5 stars. Tammy has helped us both as a selling and a buying agent, and in both cases she has demonstrated high level of professionalism, responsiveness and a commitment to her clients. She is an expert in her field and her confidence, patience and the poise with which she conducts business made us feel comfortable as clients. Our custom made house was sold within a month of listing and we had a new home to move to at the end of escrow. As stressful and emotional as selling and buying a home can be, our experience was pain free and smooth because of Tammy. She is an invaluable asset to anyone considering selling or buying a home. Thank You Tammy and Team! Sold a home in Universal City, CA. 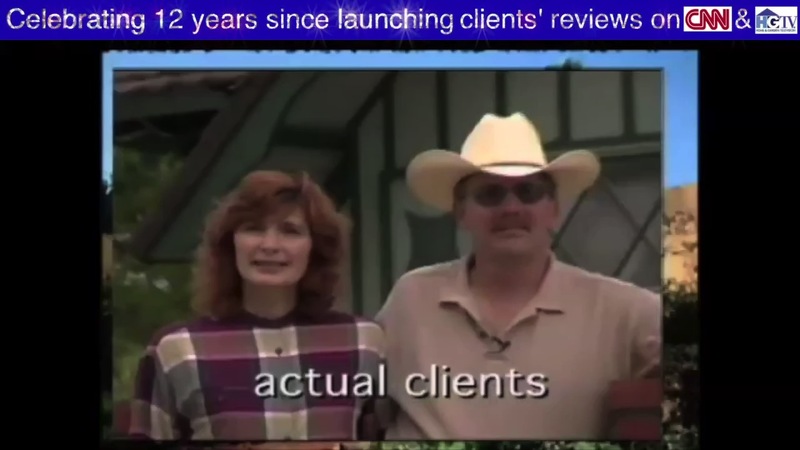 I hired Tammy Jerome to sell my home in the summer of 2014. I interviewed a few real estates agents but Tammy's resume was the most impressive. She worked very hard and sold my house. Tammy demonstrated professionalism and skill. I could not be happier with her level of service. I was really pleased with Tammy, that I ended up buying my next home though her as well. I am glad I chose Tammy in the first place. Bought a home in Encino, CA. 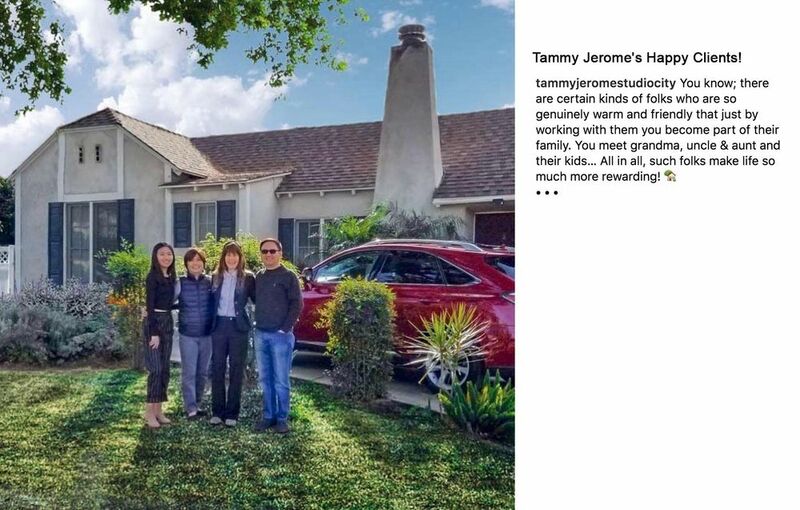 I first came in contact with Tammy Jerome a couple of years ago, probably the worst possibly moment in the last few years for buying and selling property. The financial markets were in turmoil and property values were being thrown into question. Tammy represented a seller and I was an interested buyer who had trouble getting my financing ducks in a row, partly because of the financial meltdown. 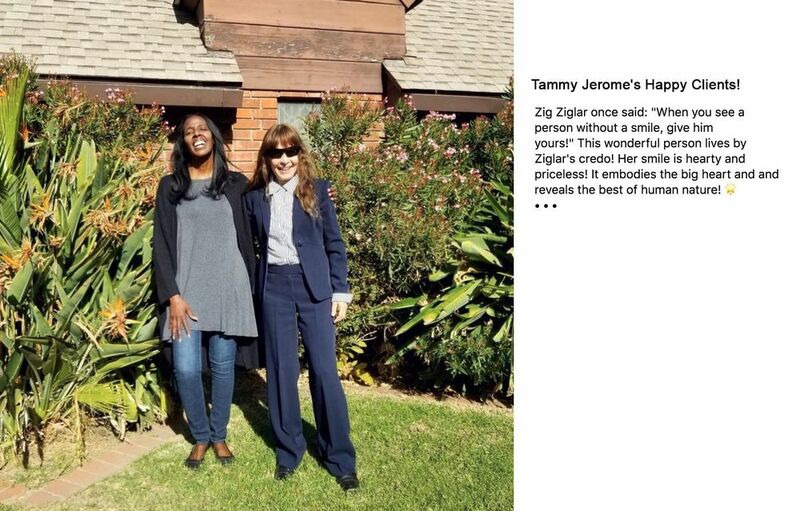 Tammy had faith in me and was able to calm the seller’s nerves during the complicated escrow process. Due to her tenacity we did end up closing escrow successfully! Since then, Tammy has kept in touch. Soon enough I might be in a position to use her talents to sell the property that she helped me buy. She is one smart cookie! I highly recommend her! Frederick B.
Tammy saved the day for us. We handed her a complicated situation -- many 'moving parts' and she handled each one beautifully and professionally as well. As I was an out of state seller, she also went above and beyond for us helping find vendors to assist with liquidating furnishings and other related - but not required of her - matters. A truly experienced professional - I can never thank her enough! Fantastic! Working with Tammy, you understand why she is a top realtor. In searching for my new home, Tammy looked for what would be a good fit for me and what I was searching for. She has great knowledge and insights of the area. After finding the home, I had the impression that Tammy cranked it up a notch. She was acutely aware of timing, how to present the best offer, competitive offers and counter offers and all that goes into getting my offer accepted. She worked with me giving recommendations, how I might approach each step and constant kept in touch. Once my offer was accepted, she made sure that I and everyone involved completed what was necessary to close the deal. I feel that without Tammy, I would not be in the home that I have. A big Thank You to her! Tammy’s pleasant and easy going personality made her a pleasure to work with. My home has offers within 24 hours of being posted due to Tammy’s excellent marketing skills. I have referred family members and friends to Tammy and will continue to do so. Tammy was excellent in presenting in a non-pushy but realistic demeanor the sale of our home. She was always available to cushion all the ups and downs of selling property. She was low-key but astute in observing persons whom exhibited an interest in purchasing the property. She also was comforting to my wife and myself whom had a strident and emotional attachment to our property of 27 years which included many happy family events. She is a sharp cookie, but always pleasant and courteous. Tammy Jerome is everything you would want in a real estate agent: knowledgeable, works tirelessly, committed, great negotiator. 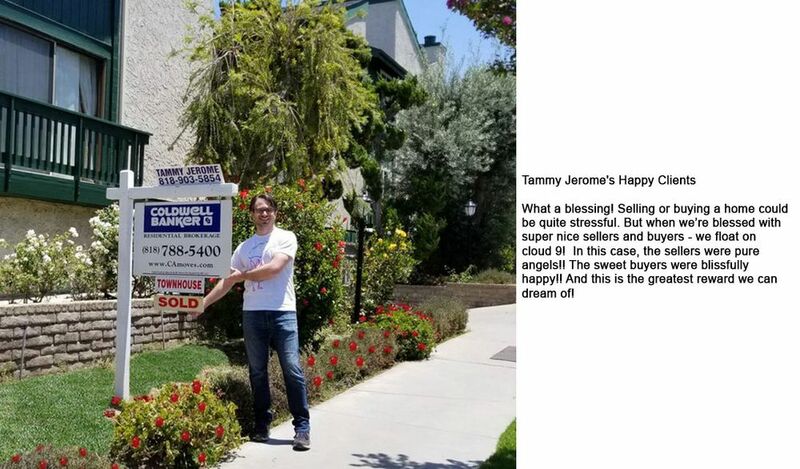 My house sold for top dollar in two days and it was because of Tammy's excellent marketing skills. I would highly recommend her! I recently hired Tammy Jerome to sell my condo and represent me in purchasing a new home. Tammy took beautiful photos of my condo and marketed it widely. I received multiple offers and it sold for over the asking price in just a few days. Tammy and her team are the best! I’m now ready to move into my new house. 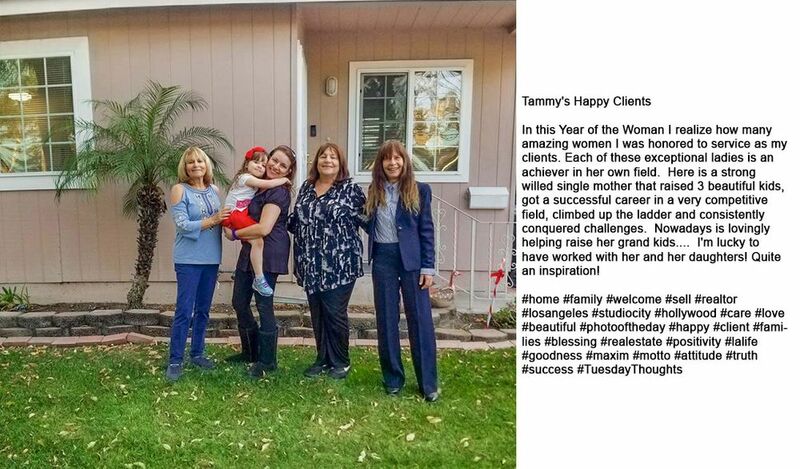 Tammy goes above and beyond for her clients. We feel that Tammy is an outstanding professional in the field of real state. Before meeting her, my husband and I were both impressed by the number of homes she had sold in the community. After we met her, we realized why she is so successful in her field. Tammy is down to earth, listens to your needs, clearly articulates her perspective and freely shared her knowledge base with us in a way that we knew what to expect. We sold two properties; the first sold at the listed amount and the second one exceeded the original listed price. 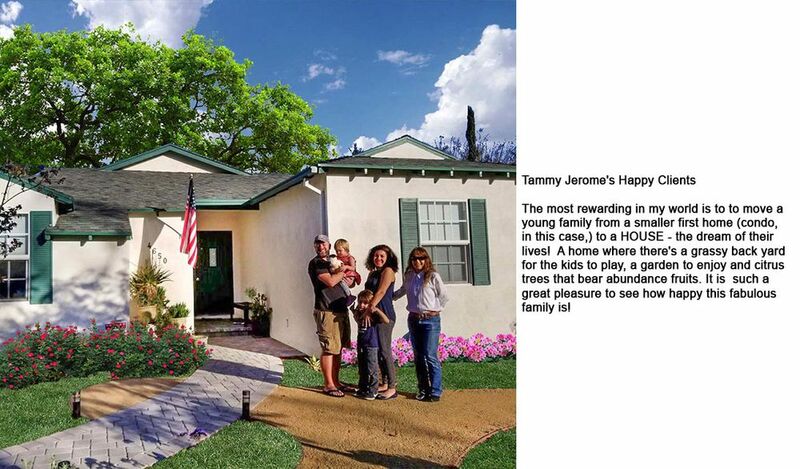 Tammy’s creative approach to selling and buying home is unique in that she adopted her approach to our needs. She spent countless hours understanding the saleable aspect of our homes and then coordinated the availability of the properties in a way that maximized the amount of interest in them. We already have friends who are interested in selling and buying homes, and we are definitely going to recommend Tammy to them. Sold a home in Van Nuys, CA. I'm a skeptical person by nature and believe trust is earned and not given. Tammy definitely earned our trust and was our best advocate in selling our home in a challenging housing environment. When we met with Tammy, she helped outline a strategy that would reflect the best way to market our home. I can say without any hesitation that Tammy is one of the best and she will serve you well. Tammy has been the top agent in her region for many years because she is the best at what she does. As successful and knowledgable as she is, she continues to work relentlessly for the people she represents. Marketing is key to selling your property for the best price; it's the main reason to hire a real estate agent. I've known Tammy for many years now, and she works harder than anyone I know to further expand her marketing expertise and provide state of the art service to her clients. When you work with Tammy, you know you'll get the best results possible. I can also tell that real estate is more than a job to Tammy. She really does go the extra mile to make sure that she understands your needs. Tammy is truly grateful for your business, and she won't forget about you after the deal is done. Expertise, understanding, and careful attention to detail is a powerful combination. 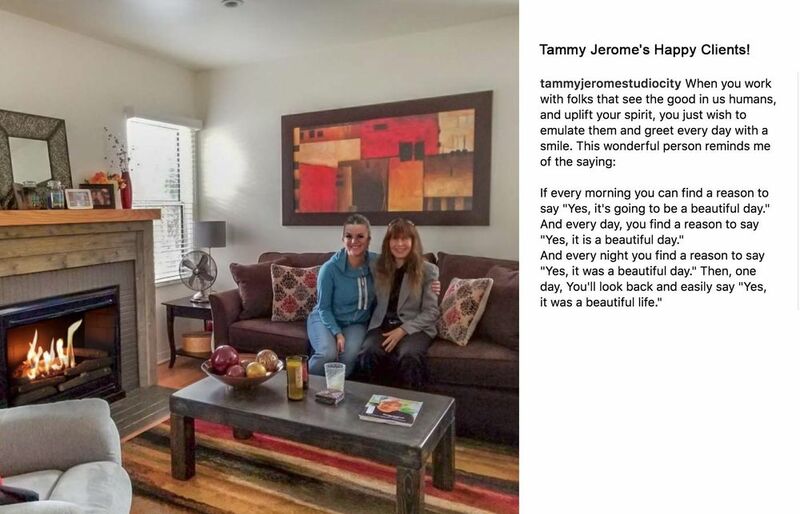 You won't find a better real estate agent than Tammy Jerome, anywhere. I'm a fan of anyone in any field who is at the top of their game, and I'm a fan of Tammy Jerome! I bought my very first home last year with the help of Tammy Jerome and her staff. I viewed dozens of properties over the course of two years and all the while Tammy remained patient, persistent and professional. Tammy worked with me from beginning to end. I bid on two properties that fell out of escrow and Tammy did whatever it took to make sure that I, as the buyer had everything in place. She personally wrote letters to builders, followed up with mortgage bankers, referred me to other real estate professionals (e.g., appraiser, attorneys and lenders). She is the James Brown of property…the hardest working woman in real estate. I know that I personally would not be a homeowner if it wasn’t for her expertise and tenacity. I whole heartily recommend her services to anyone who is serious about buying or selling property. I could not sell my Condo, and then i met Tammy, we talked, she told me that she would sell it, she was very confident, and professional, from the time she took over the listing, it became so easy, it was shown, and sold in super quick time. Thanks Tammy, im very grateful, and ready again, to have you find me another property for an investment. Bought a home in Canyon Country, CA. Tammy has been a complete delight. She helped my husband and I purchase our new beautiful home and we couldnt be happier. Tammy has also helped us with some unpleasant experiences with the old owners of the home, we don't know how we would of done it without her. She is very informative and incredibly helpful through the whole home purchasing process, I highly recommend working with Tammy!!! Arcy & I wanted to take this opportunity to thank you for all your hard work , your patience and your generous kind heart in finding our dream home. We appreciate each and every effort you made to solve our problems. 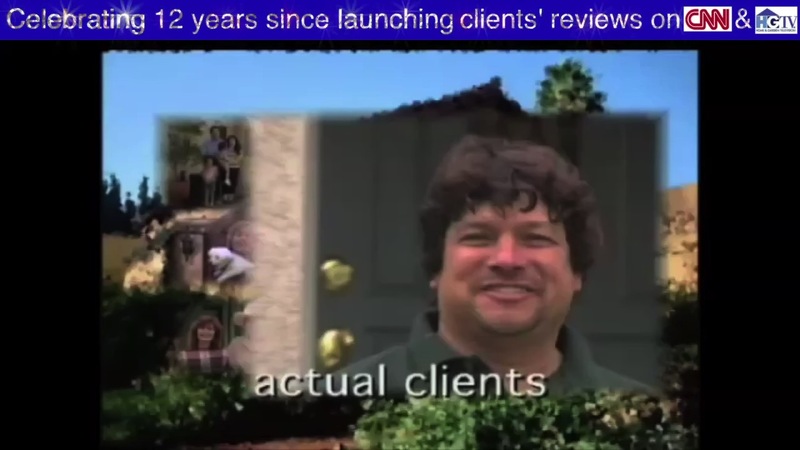 Although our situation presented unique challenges you were always a pleasure to work with. You are a very creative problem solver. You are what kept this deal together and made it go through. You made the entire house-buying process to look so easy, stress free, even enjoyable, and that is so important for first-timers. We will most definitely recommend you to anyone who may need you because we really could not have been more impressed and pleased with what you did for us. We love you. You are the best! 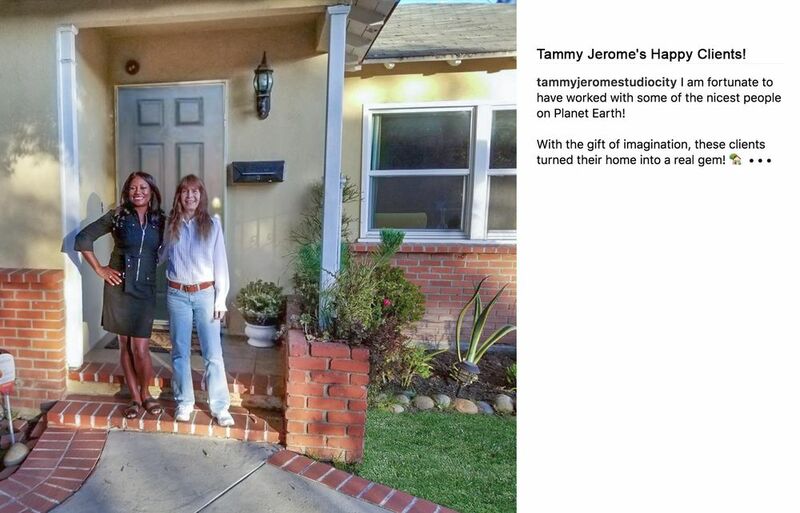 Tammy Jerome worked with us to buy our first home in the summer of 2011, a condo in Sherman Oaks. Tammy went above and beyond our expectations. She is hands down the best real estate agent in the Sherman Oaks/Studio City area. She treats you like family and works extremely hard for you. We would not hesitate to work with her again, and will recommend her to all of our friends and family. Highly recommended as a buyers agent. I had the pleasure of working with Tammy with the purchase of my first home when she represented the seller. Even then I could not get over her amazing work ethic demonstrated by her prompt responses and call-backs and attention to detail, as well as her making the closing process as easy as possible for me and the seller. Since then, we have continued to stay in touch. Tammy continues to amaze me with her thoughtful check-in emails every now and then. I have truly enjoyed working with her and I look forward to working with her in the future. Bought a home in Reseda, CA. We house searched for a year without any luck, then we found Tammy Jerome. Within a couple weeks we found the home that we'd been waiting for, and Tammy's expertise helped us to close the deal with ease. Almost a year later and we're settling nicely into our happy home thanks to Tammy. She's THE BEST! I worked with Tammy both when I bought my condo in 2009 and again when I sold it in 2013. I've moved to New York in 2010 and Tammy also helped me find tenants until the market improved. During these times, I never had to fly back to LA or look for anyone else to help me take care of things. Tammy took care of everything, down to paying off my utility bills and installing carbon monoxide detectors in the condo. Tammy is very efficient, I had 2 offers the same week the property was listed, one of which was above asking price! I accepted and less than a month later, we closed. Everything was signed electronically, Tammy emailed me daily all the things I needed to sign and I am very satisfied with the results. 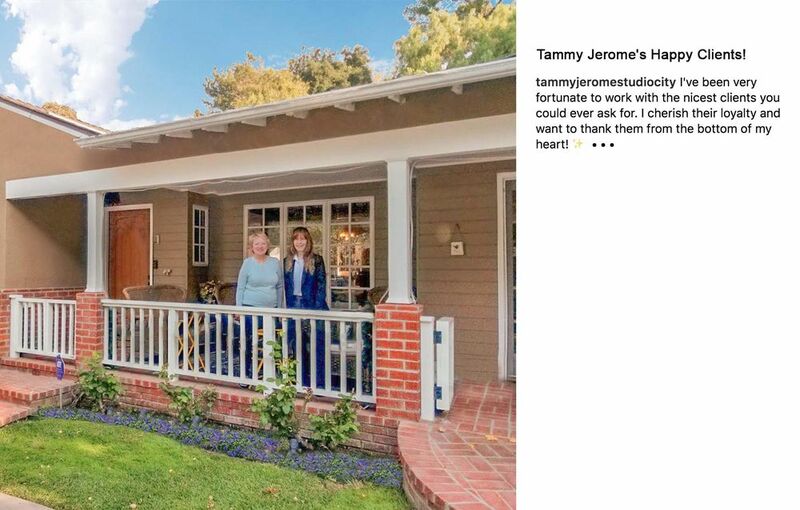 Will highly recommend Tammy to anyone buying or selling in Studio City. Tammy Jerome impressed me with how her team was so readily available if I had any questions. She helped me to buy my first property in LA as a short sale. I did not have any experience with short sales prior to this. Tammy was so helpful in making sure I understood every step in the process. Bought a home in Valley Glen, CA. Tammy is a consummate professional. I would recommend her to anyone with needs in the Valley or Hollywood Hills. She was my agent for both buying and selling. She is respected by brokers and lenders, and she will make herself available to you. Sold a home in North Hollwyood, CA. I cannot say enough good things about Tammy Jerome as a realtor and as a person. She actually likes doing business face-to-face with clients and prospective buyers/sellers. Her demeanor is always professional. She works tirelessly to help with both buying and selling, is available for questions or concerns, is very patient, always responds to calls or texts, etc., and provides solid guidance. She is very ethical and takes her reputation and profession seriously; she does not steer clients in a misguided fashion just to make more money. She knows when to be firm and when to be gentle in negotiations. 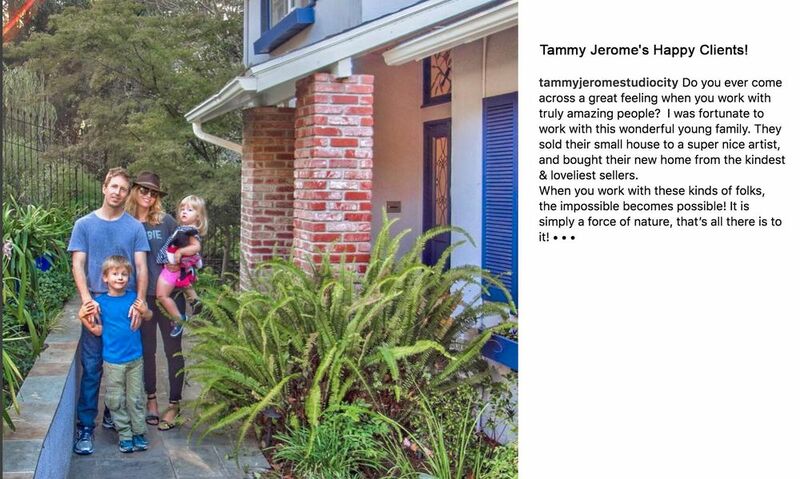 Even more importantly, Tammy continues to support her clients after the sale/purchase. She has been and remains immensely helpful to me. She may sound too good to be true, but in all the moves I have made (and there have been many), she is one of the very few realtors who goes above and beyond. I met Tammy 16 years ago, as a single woman and first time home buyer. Tammy was the listing agent on the condo I purchased in North Hollywood. I found her to be efficient and knowledgeable. My first experience buying a home was positive, so much so, that when my husband and I decided to sell our condo, we contacted Tammy. Tammy was very helpful in giving us direction to get our place ready to list, (including contacts to help with repairs). Tammy came over to take the photos of our place and made our home look fantastic on all of the digital listings. We appreciated being able to get a hold of her easily and that her response time was pretty fast. Once we were listed and the ball was rolling, Tammy never stopped the momentum to sell our place. When we wanted to view homes, Tammy was right there to take us to every home we were interested in. The home we had our hearts set on and knew was the one, seemed potentially difficult to attain. 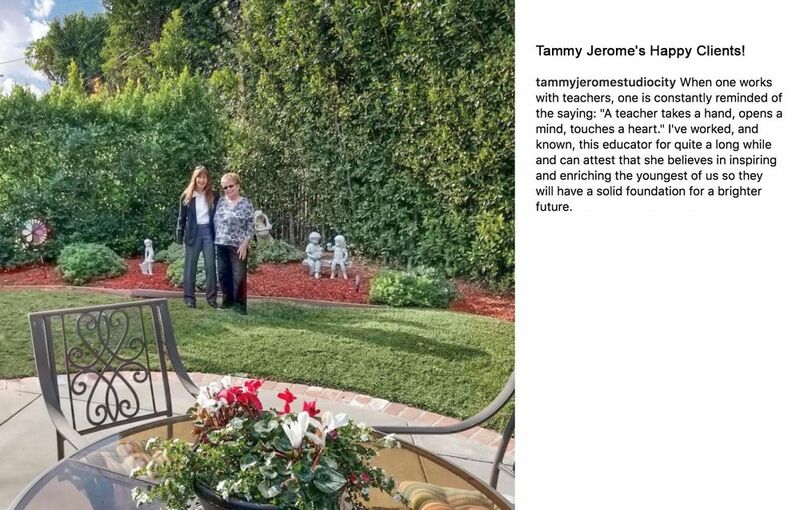 Yet, once Tammy saw it and saw our love for the home, she was incredibly diligent, persistent, and tenacious...in the pursuit of this dream house. We are certain, that without Tammy, we would not be living in our dream home now. (Escrow closed quickly on both our condo and new home). Tammy and our team worked so hard to make sure that everything went smoothly and Tammy wanted to be sure that we could move directly from our condo and into our new home. It was seamless and a dream come true. Tammy is a hands-on, invested realtor. She loves what she does and has passion and enthusiasm in her work. 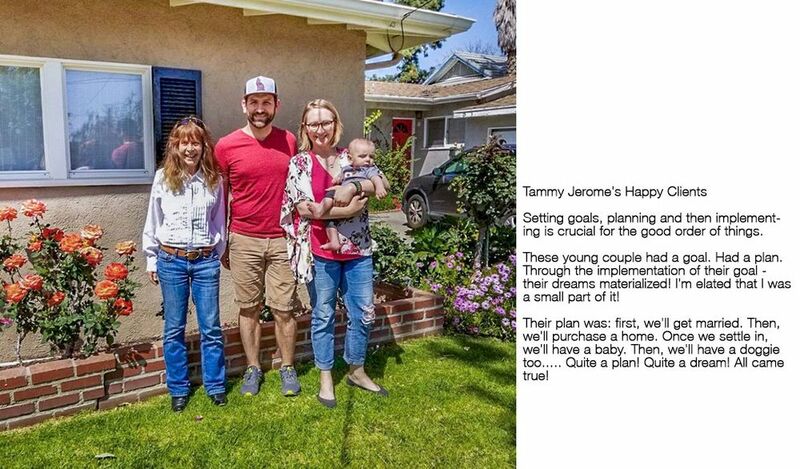 We are so grateful for Tammy and highly recommend her to anyone buying or selling their home. Tammy is truly one of the best skilled Real Estate Agents in the Valley. She Is always available to answer questions. Tammy has may years of experience and resources which come in very handy. Tammy has an excellent marketing strategy and was a very pleasant person with which to work. I'm glad I sold my old house and night a new one with her. This is our third real estate deal that Tammy has brokered for us. She is the consummate realtor, totally professional, ready to always listen, provides constructive input with pushing and always available. We will definitely work with Tammy again in the future and would not hesitate to recommend her to others in need of a realtor in the valley! Tammy really went way above and beyond in helping my wife and I find a home as our buyer's agent. She was very responsive and explained all of the ins and outs of the process with us. She knows the San Fernando Valley very well and was very professional with all of her communications. Highly recommend her and I hope she is available to represent us whenever we need to sell our house! Thankful for your service, you were a true lifesaver ! Sold our house in 3 months. It was a pleasure working with Tammy Jerome ! She is a very profesional person, responsible when it comes to her clients, and helpful and patient in every extend. It was terrific working with Tammy. She is very organized, on top of things and communicates well. And that is the key: communication. I'd have questions late at night and she would always get back to me. It's a big deal when you're selling your condo or any piece of property for that matter. Tammy helped my husband and I buy our first home, and the entire process was great. She is so experienced, hard working and quick to respond. We never felt any pressure, and we truly felt that she had our best interest as the priority, and wasn't just in it to close the deal. Thank you Tammy! Tammy was able to sell our house which had been on the market for 3+ years, a feat that 7 other previous agents and their agencies failed to accomplish. Tammy far exceeded our expectations as well as being extremely diligent, conscientious, professional, innovative, focused, and tenacious. We moved out of state before the house was sold. Tammy communicated with us daily and took on the task of coordinating all inspections and any minor repairs that were deemed necessary for escrow to close. Her customer service is outstanding! Thank you Tammy. 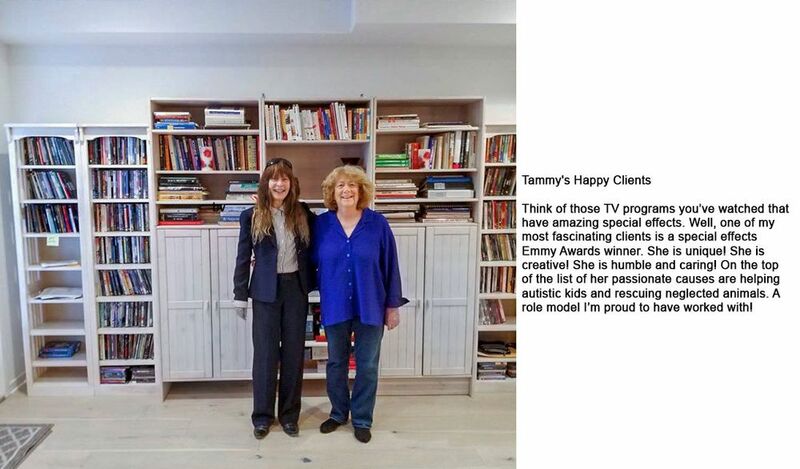 Tammy is, without a doubt, the best agent I've worked with. There's a reason she sells so many houses, and you really benefit from her experience when working with her. She works tirelessly, and just gets it done. I had an offer on my house before the first open house and there was never a doubt if it would sell. She just knows how to play the game, how to market it, and how to close the deal. Tammy did an excellent job selling our Town home. Tammy Jerome was incredibly helpful and went out of her way to help us sell our home. We had some very difficult challenges with regard to our home and Tammy was right there through thick and thin. She helped us to get through all the hurdles which were unique to our home and which made it particularly challenging to sell. She was always very prompt, very easy to reach, and I just cannot tell you how generous she was with her time--above the call of duty. I mean it sincerely. I would highly recommend working with her. I would highly recommend Tammy Jerome for your home purchase. I found Tammy to be very helpful, proactive and thorough. She was always very responsive to my questions and good at explaining the purchase process and escrow. Further, she has great follow up and has even been in contact with me over a few questions that arose after the closing. She is very professional and really went to bat for me. Tammy was the best! She knows the San Fernando Valley very well, and leveraged her experience to price my home to sell. Tammy took time to ensure that the photos highlighted my home's best qualities. In addition, she used her rather extensive marketing budget to ensure my home reached several buyers. I received multiple offers, over asking within three days of being on the market, and closed escrow in 30 days. I highly recommend Tammy Jerome! She was progressional, kind, and honest! 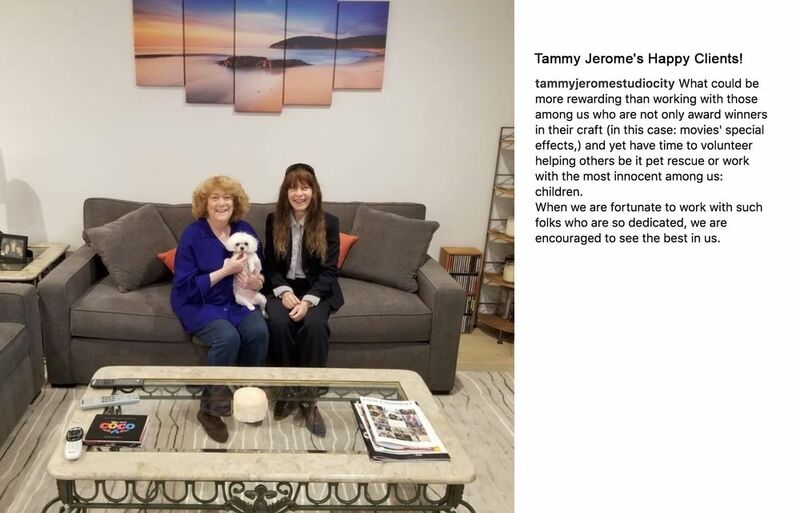 I've worked with Tammy 8 years and she is one of the most professional, kind and caring realtors that I've had the pleasure of doing business with. I admire her being an over achiever yet she is still very humble. If you are in the market for a realtor, you can rest assured that she will have your best interest at heart and work for you. 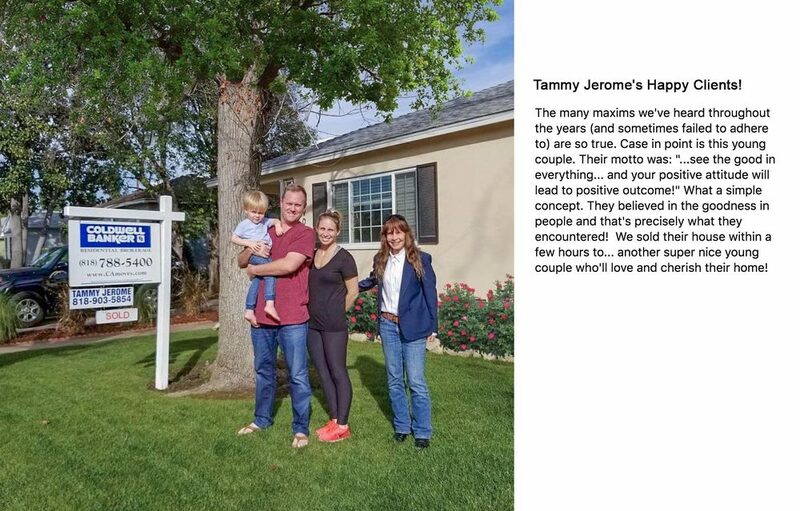 My husband and I hired Tammy to sell our home and could not have been happier with the process or the results. Tammy made everything seamless and was so easy to work with. She really went the extra mile to make certain the photographs were just right and even put together a beautiful marketing video. Our home was under contract 3 days after listing before the first open house even took place and I don't doubt it was all thanks to Tammy. We highly recommend her and would absolutely welcome working with her again! Tammy helped me sell my Townhouse. I had no knowledge of real estate and she guided me every step of the way and explained everything to me. I was pleased with the journey and the outcome. Thanks Tammy. Tammy Jerome is one of the smartest people I have ever known. She also has the gift of "timing" which is just magical. She sold my house so fast and is such a great negotiator. I got a great price. It was a relief to feel like your agent was capable of handling anything that might come up. Her marketing skills are amazing. I trusted her completely. She is calm and experienced and I am so glad that I chose to work with her. It was as smooth as could be.